Wheat is an important crop in rotation across the Prairies but has declined in profitability relative to oilseeds and pulses. Although growers sometimes look to wheat as a break-even crop in rotation, researchers in Saskatchewan are developing an improved knowledge base about wheat management. There is the opportunity to intensify rotations that may provide higher yields, improve protein, or offset the impacts of diseases such as Fusarium head blight (FHB) with higher yielding varieties. For the study, six different wheat varieties in three wheat classes were compared including three hard red spring (CWRS): Carberry, AAC Cameron VB, CDC Utmost VB; one soft white spring (CWSWS) – AC Andrew; and two Canada Prairie Spring (CPS) – SY Rowyn and AC Ryley. Along with the Melfort location, the project is also being conducted using the same protocols at four other locations across the province including: Indian Head, Swift Current, Scott and Yorkton. 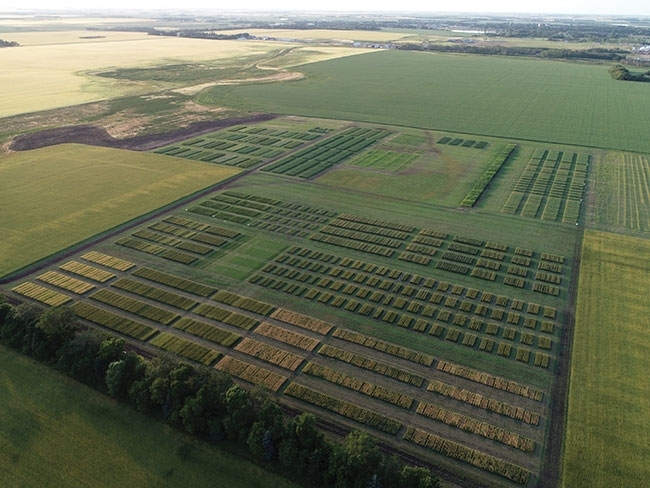 This will allow researchers to determine if more intensive wheat management pays off across Saskatchewan or only in certain regions, or if certain varieties or market classes are more responsive in some varieties over others in certain regions as well. Across the three management systems, conventional, enhanced and intensive, different treatments and rates of inputs were compared. The conventional system included a seeding rate of 200 seeds/m2, 75 lb/ac N, 25 lb/ac P2O5 and no other inputs. Under the enhanced system, the seeding rate was 300 seeds/m2, 98 lb/ac N, 33 lb/ac P2O5 and one fungicide application at anthesis. The intensive system included a seed treatment, a seeding rate of 360 seeds/m2, 120 lb/ac N, 40 lb/ac P2O5, two fungicide applications at the flag leaf and at anthesis and a PGR (plant growth regulator) application. Data on the plant density, maturity, yield and protein were collected for each variety under each management system. The economic calculations were based on the regional variable costs of production per acre listed in the 2017 Saskatchewan Crop Planning Guide. The crop yields and protein levels were based on actual average field plot values per treatment, and a price return per bushel calculated from an average base price in January 2018. A ratio of total expenses was calculated and applied to each management system based on the treatments included. For example, only the intensive management had a PGR treatment, and its cost was not included in the other two systems. For the CWRS varieties, the costs of production averaged out to be $190 for conventional, $230 for enhanced and $290 for the intensive management system. “We found that in Melfort during 2017, under all three management systems, CDC Utmost VB had the greatest return of any variety. Carberry, Cameron and Andrew also produced profits under all three systems, but Carberry tended to show decreased profits with increasing management, whereas Cameron was more stable, and Andrew tended to increase. Both CPS varieties tended to have losses or near break-even values. Results generally indicate that enhanced management can both increase yields and profits, but intensive management may not always be the best targeted management scheme. Also, despite having elevated yields, CPS varieties may not be the best selection, depending on some economic factors. The preliminary results are based on one year of data from the Melfort site only. Once the study is completed in 2019, the economics for all five project sites and across all sites will be determined. “The preliminary observations show that cultivar selection and the level of intensive management can make a difference,” Pratchler says. “From a risk management standpoint, in most cases producers may be better off to move to an enhanced management for particular varieties, and they may not need to move to the full intensive management system to realize good returns. As well, some growers have considered moving away from hard red spring varieties because of FHB disease concerns and lower protein levels, however these results show that economically that may not be the best recommendation.